Buy-to-Let (BTL) investors are taking on an increasingly relevant role in the UK housing market. In this post, I present some initial findings from my ongoing research on BTL. I use data from the England and Wales Land Registry and the Zoopla web portal to find properties that are advertised for rent shortly after being bought. I show that: 1) BTL investors prefer (a) London and (b) flats; 2) BTL investors are more likely to pay cash; 3) BTL transactions are faster; 4) BTL investors buy at a discount; and 5) BTL discounts are larger for (a) Northern regions and (b) big properties. Data from Department of Communities and Local Government (DCLG) show that the stock of housing held for private renting has more than doubled in the past 20 years, from 9% of the stock in 1993 to 19% in 2013. Despite this expansion, we don’t know much about BTL activity. There are some papers on the role of housing investors in the recent US housing boom (for instance, Haughwout et al, 2011) but none of them specifically on BTL, except for Molloy and Zarutskie (2013), who analyse US large-scale investors’ activity after the housing bust. I assume that flats or houses advertised for rent within 6 month of their purchase are BTL properties. To find them, I use rental adverts from Zoopla, the second UK property portal in terms of traffic, as provided by Whenfresh, a data company. A Bank colleague, Perttu Korhonen, has matched these data at property and transaction level with the corresponding sales in the England and Wales Land Registry. This work was described in a previous Bank Underground post. Using this definition over the 2009Q1-2014Q1 period, I detect more than 100,000 BTL transactions. These closely match the aggregate trend in BTL mortgages for house purchases computed by the Council of Mortgage Lenders (CML), so we have confidence in this constructed measure. 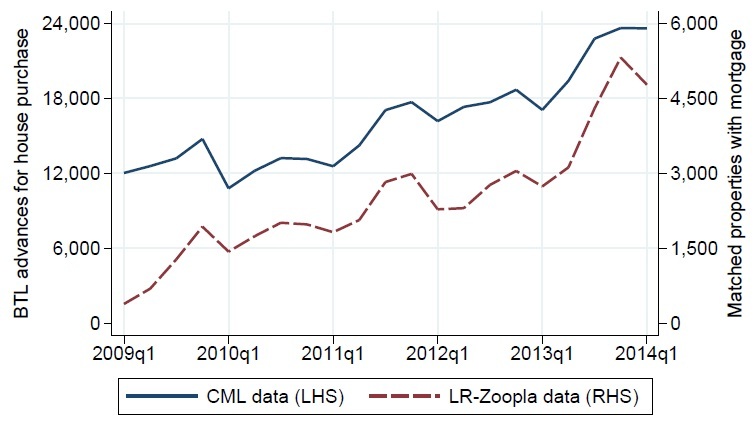 The solid line in figure 1 shows quarterly CML data over the sample period, whereas the red dashed line represents our subsample (restricted to BTL transactions funded by mortgages, to be consistent with the CML data). BTL investors target areas and type of properties with a large private rented market. Figure 2 lots the percentage of Land Registry transactions classified as BTL against the percentage of the housing stock privately rented (as reported by DCLG). The left-hand side chart shows that BTL activity is much more common in London than elsewhere. The right-hand side chart shows that flats are more likely to be sold to BTL investors than other types of dwellings (terraced, semi-detached, and detached houses). Land Registry data suggest that around 70% of property transactions are financed with a mortgage. Among BTL sales, only 50% are so: a half of BTL transactions are paid in cash. This result is robust across property characteristics, sale year, and location. So, for example, it does not depend on BTL investors purchasing cheaper properties which are incidentally more likely to be bought with cash. The time needed to sell a property can be measured by matching sale adverts in the Whenfresh/Zoopla data with Land Registry transactions. On average, going from online advert to completion takes 5 and half months. For all BTL properties (cash- or mortgage-funded) this interval is reduced by 2%, i.e. approximately 3 days. On top of that, all cash transactions (BTL and others) entail an additional 6% reduction in time-on-market, corresponding to a 10-day decrease. The media often contain stories of BTL investors pricing other buyers out of the market. It is expected that additional demand from a group of buyers such as BTL investors will raise price on aggregate, although this general effect is difficult to isolate in practice. It is less clear whether a direct effect is also at work: are BTL investors willing to pay more for the same properties? To investigate this question, I compare properties bought by BTL investors with properties bought by other purchasers, keeping all the observed features (such as number of bedrooms or postcode) constant. Crucially, I can further restrict my analysis to properties that had the same advertised price, but are sold to different types of buyers, one of whom is a BTL investor. It turns out that BTL investors spend on average less than other buyers for equivalent properties: the baseline estimate shows a statistically significant 1% discount. Or, put differently, other buyers spend 1% more than BTL investors for the same properties. The 1% aggregate figure may hide a wide range of different discounts. Some regions may be less attractive to BTL investors because they have smaller rental markets. 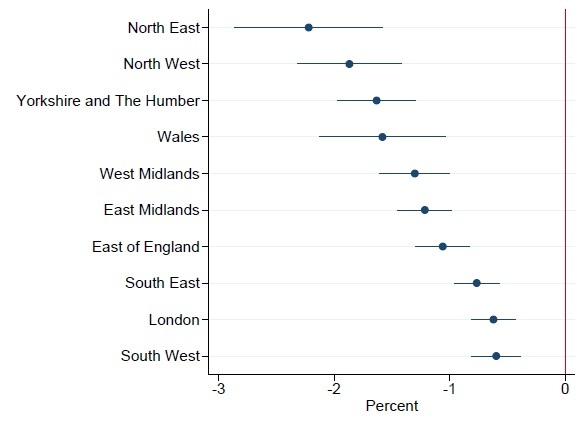 Figure 3, shows that BTL investors invest in those markets only in exchange for larger discounts: in the North East of England, the average BTL discount is 3%, whereas in the South of England and in London discounts are below 1%. A similar analysis shows that flats are associated with a discount smaller than 1%, whereas semi-detached and detached properties – which more rarely host private renting households – sell to BTL investors at a 1.5% average discount. In general, big properties take longer to sell, which leads to larger discounts. But these BTL discounts are computed relative to other buyers, implying that BTL investors are better at translating a longer time-on-market into a price reduction. The evidence gathered so far suggests that the impact of BTL investors on the housing market depends on the cycle. In a market where properties take a long time to sell, BTL investors can play a helpful role as buyers of last resort and contribute to market clearing by accelerating transactions. In a market where prices are already going up, BTL investors obtain lower discounts and could put additional pressure on property valuations. We are still far from the last word on the effects of BTL, but the available micro data are greatly improving our understanding of this part of the housing market. Philippe Bracke works in the Bank’s Structural Economic Analysis Division. Next Post Human capital depreciation during unemployment – does it matter for monetary policy?